The Holcombe point type was first defined on the basis of specimens recovered on Holcombe Beach in Macomb County Michigan. 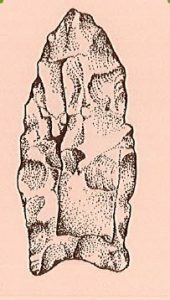 Often made from Onondaga or Bayport Chert, this lanceolate point with a concave base and fine parallel flaking is confined to the later part of the Paleo Period ca.8000 BCE. Holcombe points are always quite thin, have lateral edge grinding, and are rarely fluted. Although rare in Southern Ontario, at least one site with predominantly Holcombe points has been documented in the area. This point classified as Holcombe is made from Flint Ridge Chert, which outcrops in Ohio. According to knowledgeable researchers, very few Holcombe points are made of this material. At first glance, this point appears to be uni-facially fluted (ie. similar to fluted points). Close examination reveals that a large flake was removed during the preform stage, and that it is not a flute but rather a scar from a large flake removed from the tip. The concave base has been heavily retouched but is not ground. Based on size alone, this point is much larger than typical Holcombe points measuring at 5.7cm in length. As with the specimens found at Holcombe beach, it is possible this point finished it’s life as a hafted knife.